It was on a trip to the Philadelphia Museum of Art in 1982 that I first encountered what is now my favorite riddle. Standing before Rogier Van der Weyden’s c. 1460 Crucifixion, I couldn’t shake the feeling that the two red drapes were meant to be read as the same drape. I don’t mean the artist merely painted the same drape twice. I mean the drapes seemed to mark only one place and only one moment, repeated metaphorically to indicate sympathy between the Virgin and the crucified Christ so extreme that their experience was synchronous in both time and space. The idea came directly from my having seen Barnett Newman’s c. 1958-66 Stations of the Cross just the day before in the National Gallery of Art. The Stations are a series of fourteen abstract canvases of identical dimensions, painted in spare divisions of either black or white paint on unprimed canvas, with the placement of these divisions based on two lines repeated in each panel. In a statement written for the work’s inaugural exhibition at the Guggenheim in 1966, Newman instructed the viewer that the story of the passion was for him an expression of a single idea—the existential complaint implied by the question, “My God… why have you forsaken me?”, that Jesus quotes from Isaiah. Newman insisted the panels were not to be read in their traditionally episodic manner, but as fourteen expressions of that same human cry. What struck me about the Stations that day in Washington—and what informs my reading of the Van der Weyden piece to this day—was how Newman seemed to transform the viewer’s experience into something like Mircea Eliade’s idea of an eternal return: a circular rather than linear sense of time, created in this case by the repetitive positioning of the vertical elements in each panel. To stand, for instance, before the Eighth Station was to return to the place experienced in the Third Station, but in a slightly altered mental state. Each canvas brought you back to the same conceptual location, but with your sense of place abstractly adjusted by subtle changes. The effect is that of an inner expanding moment, an abstract narrative that returns again and again to the same event. The focus of the Philadelphia Crucifixion is on the Virgin’s swoon, a rendering of the moment Christ’s expiration causes his mother to faint, tying both figures in a synchronistic loss of consciousness—one of actual death (though theologically temporary), the other of profound empathy. Van der Weyden had addressed this subject before in the Prado Deposition. Placing the two figures in separate panels, as the Philadelphia Crucifixion does, reiterates the synchronicity of the Prado piece, while giving greater emphasis to their physical separation, thus generating the riddle of the drapes. Why two? Why not one drape extending from the left to the right panel as the ground and the wall do? A single red drape was occasionally employed by Flemish painters as a theatrical backdrop for a passion scene. 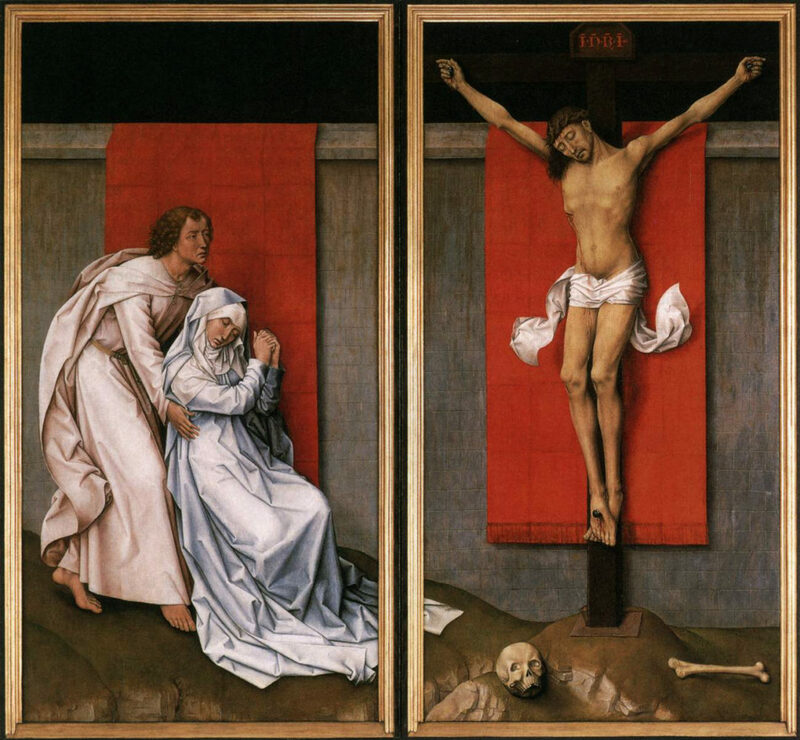 Van der Weyden himself made use of one in the Escorial Crucifixion, also featuring the Virgin and St. John. The answer I feel lies in how the artist portrayed both Virgin and Christ as suspended in a specific moment of suffering. Each is physically hanging: the crucified Christ on the grotesque apparatus of the cross itself, the Virgin in the arms of St. John. Both imply a center of gravity delineated by the central axis of each drape. So the drapes are not just an occasion to introduce a symbolic field of color, but are hanging, suspended elements that echo the simultaneous collapse of the two principal figures. Separate yet identical drapes imply that the Virgin and Jesus are sharing a single moment in a single space, that their suffering is one and the same, even though they are physically discreet figures. It is an idea uniquely suited to the pair’s prenatal history and it seems no more illogical than other aspects of Roman Catholic mythology. To test my theory, I began drawing lines over the image in search of a hidden structure. After several attempts, one set of lines settled neatly into the composition. 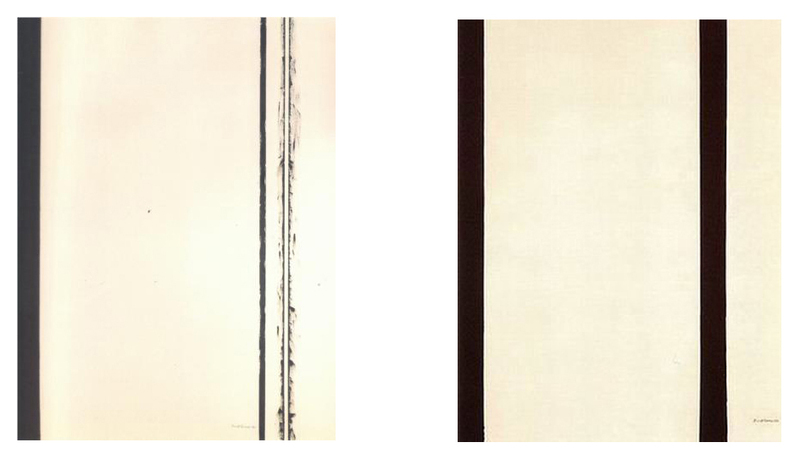 Drawing two parallels from the lower corners of the drape on the right panel, across the painting to the lower corners of the left panel, and repeating the same lines in the other direction (estimating the position of the hidden lower corners based on those in the opposite panel) the intersecting lines formed—no surprise here—a cross. But not so easily dismissed is how these parallels follow many subtle elements in the picture’s spatial and figural arrangement. For instance, the lines emanating from the crucifixion (right) panel emphasize the subtle turn of the figure toward the center of the painting, or perhaps toward the Virgin, while the lines emanating from the other panel appear as if they were guides used in structuring the figure of the Virgin herself. Moreover, the inner line from the right panel seems to mark the edge along which her gown breaks from its vertical fall from her knees to its horizontal spread across the ground, while the second line defines the rift mentioned earlier: the break in the ground that passes from one panel to the other and to which there may be drawn (in reference to the earth’s “rending”) a connection to the narrative itself. Other intriguing details follow: the skull and bone remaining outside the delineated cross; how the edge of the earth rising up toward the left panel’s drape outlines the earth itself as it runs along the base of the wall; how the lines from the left panel imply the grade of the earth on which St John stands, holding the Virgin in place. Admittedly, speculation like this begs for more documentation than I’ve provided, and in that regard I hope someone of more substantial ability will someday follow through. 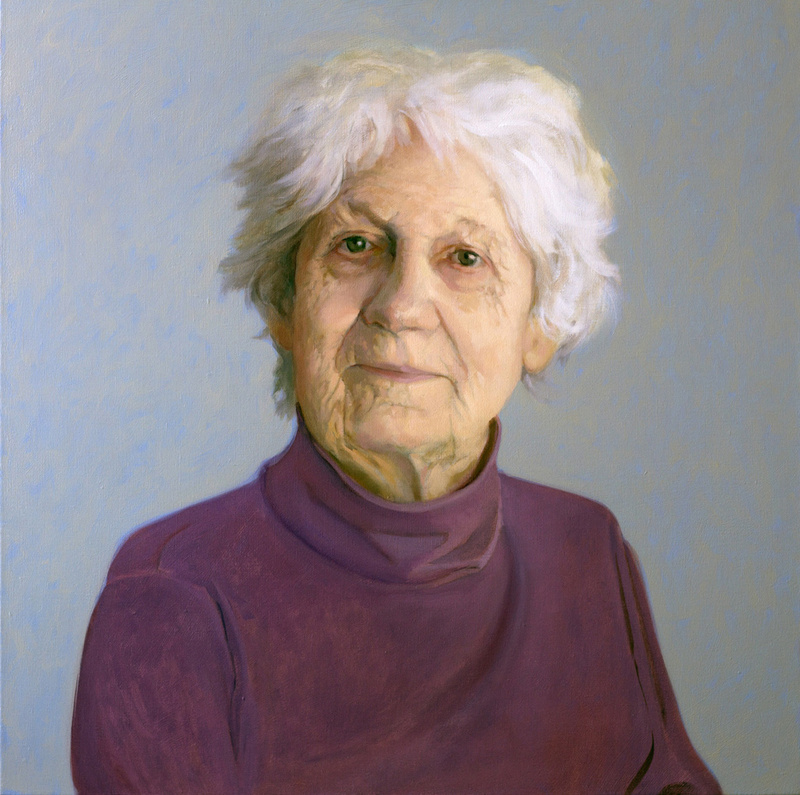 As to the immediate matter of painters commenting on paintings, my wish was to illustrate that an artist’s intuition regarding a historical work requires neither logic nor conclusive proof to hold significance for that artist. I remain firmly invested in how these two works connect across four hundred years. I am as captivated as ever by the link between them, regardless of any historical impertinence. Frankly, I would be disappointed if I were to discover one day that a scholar proved definitively that I was wrong about the drapes. And yet I would not be discouraged. That it could have been possible would still have significance for me. Nice job Peter and not a bad painting of yours either. I have learned a lot from Rogeir Van der Weyden. c.1460 you mean, Rogier died in 1464.